Termites bring nothing but frustration, fear, and financial stress to your home. Are you wondering if you can wait until they die off? Well, we have some bad news for you. 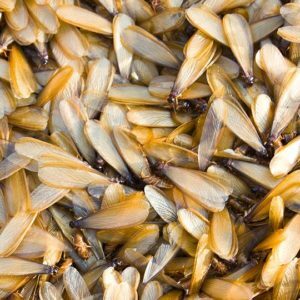 Learn about the life cycle and life span of a termite to find out why you’ll need to take action now. Termites have an interesting reproducing cycle, compared to other pests. Many times in the insect world, there is one queen who lays all the eggs. Not termites! There are specific termites whose job it is to reproduce to help the colony grow quickly. The life cycle begins when they leave the nest to procreate, and sometimes they’ll then form their own adjacent colony, becoming queens themselves. The fertilized queen lays her eggs, and the eggs hatch into larvae. They are pale and white. The larvae shed their exoskeletons, called molting, and then become nymphs. They develop into castes, like workers, soldiers, and other reproducers. Termites have an interesting ability to molt many times to meet the colony’s needs, changing castes. At maturity, the termites go off and do their job. For example, the reproductive termites develop wings and functioning eyes, and their bodies become harder and darker to accommodate the elements outside of the nest. They swarm as their parents did, and the termite lifecycle begins again. Compared to other pests, workers and soldiers live to be a surprising one to two years old. And queens reign for a long time, living over a decade under the right conditions! This means you need to take action right away to get rid of a termite infestation. 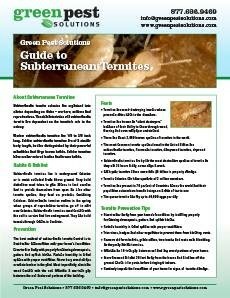 Termites Won’t Last Long with Green Pest Solutions Around. Don’t hesitate to call the pest professionals at Green Pest Solutions if you’re dealing with a termite problem. We know how expensive termite damage can be if not treated right away, and we also know the best ways to rid your home of them. Give us a call today at 877-636-9469.